I like female miniatures. I think one of the fundamental realities of the 40K setting is that is sufficiently dark that petty differences begin to fade away in response to a greater threat. If the Tyranids, or the Warp, or any one of a thousand other threats is about to devour your planet, do you really have room to disregard half your population? I like them even better when they’re not cheesecake, or tokenized. What I’d really like is female Guard figures, for which I have had depressingly little luck. Enter Victoria Miniatures. I’ve had my eye on Victoria’s Arcadian Rifles miniatures for awhile now. Victoria produces a number of Guard-alike figures with several ranges to choose from harkening back to either classic Guard units like the Praetorians or Mordians, or with alternative sculpts. Flirting with a new Guard project, I ordered a squad of the female Arcadian Rifles (there are also male sculpts available). At $49.90 for a complete kit of 10 figures plus weapons, they’re a bit on the pricey side, close to double the cost of a plastic Cadian Shock Troops kit, but cheaper than a squad of Elysians, which is $53 at the present, the pound having taken it in the teeth lately. So how are they? Ordering and Delivery: Ordering was easy, with a minor snafu from PayPal not handing me back off to Victoria’s server solved with a quick email. I ended up ordering both the full squad and a set of kneeling legs, both because I liked the look of them, and because it pushed me over the free shipping threshold, effectively getting me more toys for less money. The package arrived promptly, shipped Air Mail and well padded, at least as fast as I’d expect from ordering anything else from Australia. Sculpts: The sculpts are everything I’d expect from Victoria Lamb. If you don’t know know who she is, check out The Rescue of Sister Joan and Firey Angel. Even a decade later these pieces are outstanding, and at the time…well, to someone just getting into the hobby, they were something of a revelation. The faces are detailed, with realistic expressions that go beyond just “Shouting!” and there’s plenty of small details for those who want to lavish attention on their miniatures, without going overboard. Appearance wise, they’re closer in style to the old metal “Classic Cadians”, looking a bit like what you’d expect if you lifted “Classic Toy Soldier” and placed them in the 41st millennium. That’s not necessarily a bad thing, and for the intended project, an air cavalry Imperial Guard regiment, it’s actually pretty perfect. Gender wise, they’re clearly and unambiguously female, without being comically proportioned. There’s a slight taper at the waist and a roundness to the hips of the figures, but otherwise they look like women in standard infantry attire. If you’re looking for pinup-type models with high heels and exaggerated busts, this isn’t the line for you. The resin used is pretty hard and seems reasonably durable. One note is that the figures are clearly meant to be used with slot bases (some are included). Removing them is trivially easy, but in several of the walking figures it leaves them with not a ton of surface area to be glued onto a base. This probably isn’t a problem when using flat surfaced base like stone, urban streets, etc. but when I mounted them on Secret Weapon’s Blasted Wetland’s bases, which are fairly gritty, it was a little tricky. So far, so good. So…can some ladies join the Imperial Guard? While roughly the right height (accounting for being in recessed bases), the Cadians are considerably bulkier. The Arcadians have smaller heads, thinner arms and legs, and are generally “slight” in a way that would look odd on the tabletop. I’ve heard that Elysians are slightly more delicate as well, but I don’t have any of them for comparison. The thing is, on their own, I don’t think they’d look jarringly wrong, or be of a sufficiently different size to dramatically change things like cover and line of sight. It’s just going to be a little hard to “Mix and Match”. Victoria sells a number of heavy weapons, but they’re all over a very bulky “Riveted Iron Chassis” look, and the crew arms available match that aesthetic – they’re less about interacting with the weapon, and more about pointing downrange and lugging an ammo crate into place. If that’s not the look you’re going for, a little creativity is going to be called for. The available arms are somewhat at odds with the way one would expect to interact with Games Workshop heavy weapons, and as far as I can tell there’s no mechanism for a missile launcher at all. It’s not impossible, of course, but it’ll take some work and possibly sculpting. Overall: I’d give the Arcadian Rifles female figures a solid 9/10. They’re outstanding miniatures, detailed, well-cast, and…anatomically plausible. They’d make outstanding figures for a female Imperial Guard unit, or with the Arcadian Rifles male figures, a mixed gender force. They are a little steep price wise, and unfortunately despite being really appealing, aren’t quite a drop-in substitute for the full range of units one might expect in a Guard force, and are of a sufficiently different scale that it will be hard to smooth out those gaps with say, Cadian arms. Glad to see you posting up again! I have two sets from this line: the Arcadian guard, and the “Mordian” version she makes. Would agree the models are fantastic, and I think, especially for the females – the slightness works well when mixed with Cadians. The bigger issue for me are the helmets: the Arcadians seem to be modeled after the older Pewter Cadian range (which look more like Vietnam era U.S infantry.) … whereas modern Cadians have these massive helmets crash test safety helmets on ’em. A full Victorian range of infantry would be something to behold – and I would highly recommend it for anyone dreaming of a Mordian, Praetorian or mixed gendered IG army that has either the cash up front, or is comfortable with building up slowly. Certainly anyone considering making the investment into the Pewter or OOP versions of the IG range should stop what they’re doing and buy these instead! They really are fantastic. I’d love some female drop troopers! But some badass women Sgts will have to do for now. Keep on writing! Love the content here. I’ve got several squads of Victoria’s Arcadians and Not-Modrians in my Guard army; love ’em to death. They ARE a tad ‘slight’ as you put it, but overall they look quite good. 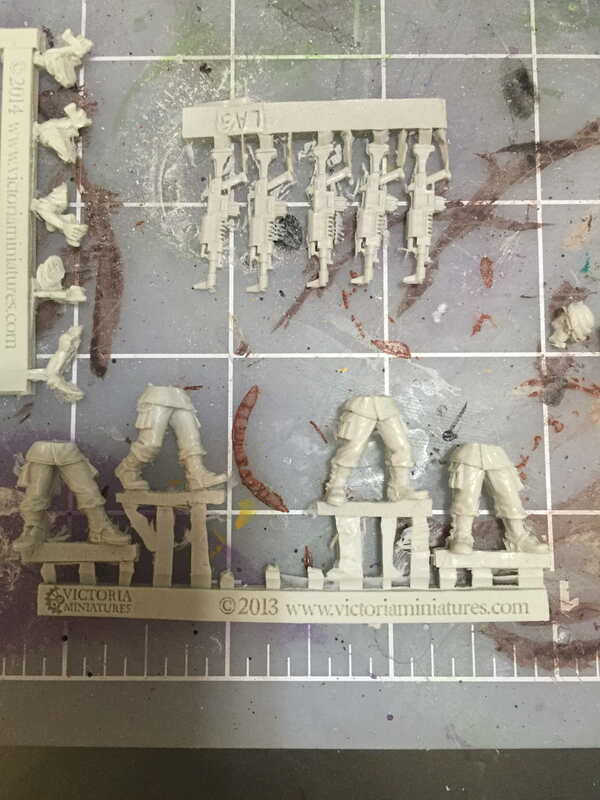 Victoria Miniatures has some great special weapons – their meltas are zoggin amazing and the plasmas are close enough to get the point while still being distinct. I noted your comment on Heavy Weapons, and went and looked at mine – I have a set of three Missile Launcher teams made of Arcadians. Looking at the minis, it looks like I cheated and used the arms off the Heavy Weapon sprue for my gunners. What about if you compared them to the old metal Cadians? I have a bunch of them and was curious about adding these ladies to bulk up the force a bit. Do you think they’d be closer to them than the current plastic Cadians, in scale? I don’t have any old Cadians on me, but if they’ve experienced the same scale inflation as the Space Marines in the same time period (old Space Marines are *tiny* in comparison) they might work. I think they’re scaled and modeled after the pewter line. You can see it in their helmet shapes… though I think the metal cadians would still be a bit heftier. To a lot of people the size of the current Cadians and Catachans is a massive problem, compared to a Marine model they’re just to big! So for people starting an army Victoria’s line seems perfect! Thanks for the review. Yeah, the current Cadians and Catachans really are monsters. I can’t really say enough good things about Victoria’s line. They may be a bit more expensive, but you can’t purchase anything like them anywhere else, so what’s to complain about? For filling out an old metal army like the Praetorians or Mordians with enough lasgun troops and warm bodies, I’d agree they’re perfect. Thanks for the review! I’ve been considering buying a mixed-gender Arcadian squad to use as gue’vesa (human auxiliaries) for my Farsight Enclaves Tau list. And after seeing the comparison shots, I agree with some of the other commenters here; the new plastic Cadians are not my cup of tea at all! I can deal with “heroic scale” on fully-enclosed Fire Warriors and Pathfinders, but the 28mm true scale Arcadians look much less Uncanny Valley than GW’s human models. I agree – if you don’t already have a number of standard Cadian/Catachan type models, honestly, I’d probably go all in with these units. I’ve also been considering them for 30K Militia units, where you could “contract out” the heavy weapons to Rapier Platforms that, again, I don’t think will look that odd with Arcadian crew. I too have purchased a number of miniatures from Victoria’s and have been very pleased with the results. The Van Diemens and Broolian trench troops as well as the Scottish troopers all now adorn my Necromundan boards. I have found that the miniatures are slightly larger than the old Necromunda miniatures but not noticably different unless they are standing side by side. Victoria’s miniatures are slightly taller but slimmer and make the GW miniatures look very comic and cardboard like. I live in Australia and find her prices to be pretty much on par with GW pricing but for better quality miniatures. These certainly suit my purposes and I have no qualms about recommending this range. Now time to get some riders for those Van Diemens I suspect. Happy gaming folks. Previous Post: What’s Wrong With The Tau?